Take a yacht around the world? Sounds like a great idea. But my wife, Helene, has balance troubles due to an inner ear nerve problem, so for us, a heeling sailboat wouldn&apos;t do. The alternative-circumnavigating the globe on a motoryacht-sounded pretty straightforward, but what about the particulars? First, what kind of boat and how big? Any circumnavigation means long passages, which equals long range. For us, this meant a fulldisplacement hull. Long passages also require a minimum crew of three to stand alternating watches, plus someone to cook for those three. Add to this my desire for accommodations for up to eight family members and/or friends, and, presto, we were talking an expedition trawler of about 100 feet LOA. At age 65, I wasn&apos;t interested in spending three years on a new build. In the fall of 2005 there were about a dozen used boats on the market that fit my requirements.My choice was a 94-foot expedition trawler built in 2001 by the Halter Marine division of Trinity Yachts, based in Gulfport, Mississippi. 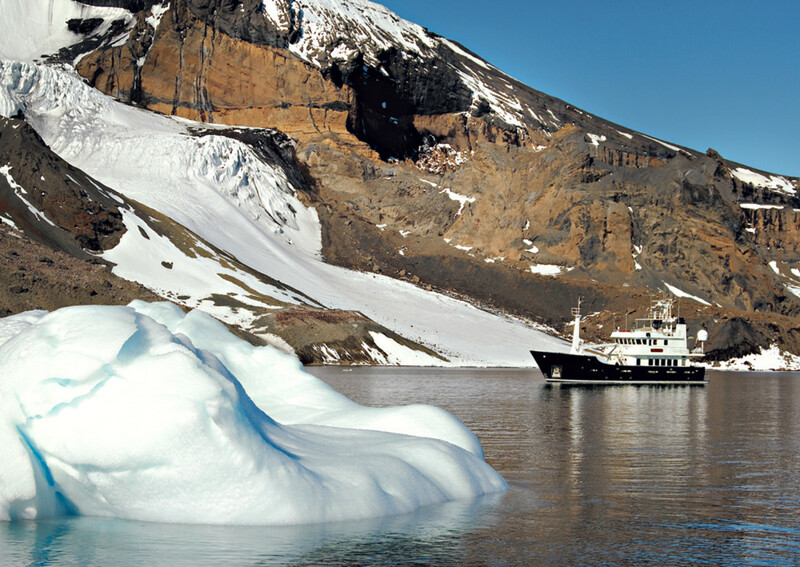 Steel hulled and ABS Ice Class 1A rated, Whale Song had seen about 2,000 hours of use over five years,making her just barely broken in.With a 4,000-mile theoretical range and redundant systems throughout, she seemed more than up to a five-year circumnavigation. I have unreasonable confidence in my own abilities to meet any challenge, but I had virtually no bluewater knowledge. My plan was to spend about 120 days a year on board, traveling back to the United States while the crew serviced the boat and took her to new locations. In hindsight, my notion of (a) buying the boat, (b) filling the boat with food and fuel, and (c) going off for five years was totally naive. However, I am also a very lucky person. At the time of this writing, I was on board Whale Song with the Zydlers, Barbara, and Resty Restituto (our engineer) in Bali, Indonesia, 40,000 nautical miles and 120,000 gallons of diesel fuel from Cape Cod. We were about to cross the equator for the fourth time, having cruised from 65 degrees south (Antarctica) to 63 degrees north (Alaska), visiting 28 countries, 80 ports of clearance, and hundreds of anchorages on four continents (North America, South America, Antarctica, and Asia) and in the islands of Oceania. I spend about 200 days a year on board, and Helene, who has found Whale Song&apos;s rolling much more comfortable than the heeling of a sailboat, joins me for about 20 percent of that time. Although we are less than halfway through our planned voyage, we have learned quite a bit about bluewater passagemaking. I have visited more than 100 countries, traveling overland for pleasure over the past 50 years. Now was the chance to explore the coastline of the world with my own boat! I do understand the benefits of thorough travel planning. The most difficult and most important step is acquiring good information. One would think that with thousands of years of maritime exploration there would be a vast body of available knowledge. There is, but the catch is that it&apos;s almost entirely for sailing vessels and merchant steamers, while we are a private motorboat carrying "tourists" (me). So we have assembled a reference library and a network of contacts. Our library consists of more than 100 cruising guides and travel guides, over 400 lb. of paper charts, and thousands of dollars&apos; worth of electronic charts-and this is for only half of the trip. Our navigation bible is the Admiralty Pilot series of books, and our travel bible is a collection of about 50 Lonely Planet guidebooks. Our contact network, built up by word of mouth and through the Internet, includes well over 100 friends, friends of friends, ship&apos;s agents, travel agents, navigation pilots, and marine suppliers throughout the world. Our itinerary so far includes the Amazon, Antarctica, Patagonia, the Galapagos, Alaska, Japan, the Philippines, Palau, Papua New Guinea, the Solomon Islands, Australia, and Indonesia. Seasonal weather, which we learn about by studying our reference library, is the primary schedule driver. Antarctica and Alaska are "summer" destinations; the Caribbean, Japan, the Philippines, and Oceania have hurricane/typhoon/ cyclone seasons; and there are rainy seasons everywhere in the tropics. Periodic heavy maintenance is the next largest influence on scheduling and route planning, and based on recommendations and the Internet, we have selected boatyards in Fortaleza, Brazil; Valdivia, Chile; Port Townsend, Washington; Cairns, Australia; and Phuket, Thailand, which we target at four- to six-month intervals. We also do our major frozen and dry goods food purchasing at these places to stock our generous walk-in freezer and pantry. Fueling is the other major issue. Although we have a theoretical range of 4,000 nautical miles, our useful range is actually less than 3,000 miles, because it is often difficult for us to obtain precise amounts of fuel. Then there are adverse currents and the unpredictability of sea conditions, which influence fuel consumption. Once weather, maintenance, and fuel have been thought out, the real trip planning starts. Even five years is a limited time, so I have to make choices about where to visit. Lonely Planet and the UNESCO register of World Heritage Sites pique my interest most, and I have not been disappointed. Brazil, Japan, Peru, and Indonesia are rich with interesting sites, but they are, according to the literature, among the most yacht-unfriendly countries in the world. I believe that it is extremely difficult if not impossible for a motoryacht of our size (185 gross registered tons) to visit those countries without the use of local ship&apos;s agents. There are a few "super agents" who provide worldwide service for merchant vessels and megayachts. These agents subcontract local country agents who, in turn, use local port agents, with each person getting a piece of the action. Generally, with our contact network, we have been able to go directly to the country agents and, in many cases, directly to the local agent. We have cleared in and out of about 80 ports in 28 countries. We have used agents for 45 of those clearances; perhaps 20 of these (costing about $30,000 total) could have been handled without agents if one had local knowledge of the language and "the ropes." In a typical clearance, four to 10 officials representing customs, immigration, health and sanitation, police, military, and the harbormaster (frequently two from each department), along with the local agent and perhaps his assistant, board us upon our arrival at a port. In some countries, such as Brazil, Japan, and Indonesia, we get the full complement, even at domestic ports. Our poor little HP printer really gets a workout generating copies of crew lists, ship registry certificates, and lists of stores, medicines, previous ports, and so on. In Brazil, we once had to produce about 100 documents. At another stop we had to collect a second group of officials because it seemed they didn&apos;t want to be left out of our exciting visit. These same countries require fairly elaborate cruising permits (obtained by country agents) and evidence of insurance (provided by Lloyds of London, our carrier). This may sound like bureaucratic hassle to the extreme, and the first couple of times it was a bit daunting. But it is now routine. We fetch the authorities with our 18-foot RIB; bring them on board to luxury they have never experienced ashore; give them a Coke or a cup of coffee; print, sign, and stamp the documents; occasionally pay a very minor fee (and get a receipt); and take them back to shore. With the exception of a couple of aggressive harbormasters who badgered us for the odd bottle of whiskey and a pack of cigarettes, we have not been held up for "gratuities," although I suspect that our agents may have greased a few palms along the way. I do not begrudge our agents their fees because they render useful services, perhaps at costs that are excessive in local terms but reasonable to us. Recently we experienced a "snap inspection" by the Indonesian navy. Six uniformed guys boarded our yacht and wanted to look around. It turned out they were just curious, but they disguised their curiosity in officialdom, going through the exercise of asking for a crew list and then forgetting the document when they left. An hour later they were back, inviting us to join in the annual Good Friday maritime procession across the harbor. What they really liked was our very loud air horn! Agents have also been useful in arranging shore visits for produce shopping and touring. Keeping fresh produce aboard is a constant challenge. Frequently we are visited by local canoes immediately after anchoring. They often have bananas, papayas, mangoes, pineapples, or whatever is in season for sale or barter. Every few days we try to visit local outdoor markets to buy more produce, but since no one has any refrigeration, everything that&apos;s offered at the market is ripe and ready to eat, which means it has a very limited shelf life for us. But the market visits are a great way to experience the local atmosphere. Keeping a supply of small bills on hand for market shopping also is a challenge. ATMs in Indonesia give the equivalent of $5 bills, but most produce purchases are about 50 cents, and vendors typically don&apos;t have any change. The fueling experience itself can be exciting. In Belem, Brazil, we fueled from a barge about half our size. The barge had one very old and slow gasoline-style pump under a metal shed. Unfortunately, just as we pulled up, a tropical downpour ensued, with the resulting noise on the tin roof so loud that no one could hear or understand any instructions. The fueling took six hours and was punctuated by occasional interruptions: giving a couple of gallons of fuel to a local fisherman, for example, and being sideswiped by the local ferryboat (whose pilot, it seemed, was just being ornery). Whale Song is one tough boat and took the abuse well. On three or four occasions we have been delayed for a few hours because of fueling or port clearance, but given that we have experienced more than 100 fueling and clearance events, this is remarkable and most likely would have been impossible without agents. With a complicated piece of equipment like Whale Song, keeping up with repairs and maintenance is a constant challenge and the largest item in our budget. When I bought the boat, I had a thorough survey performed, which disclosed very few deficiencies. This was a bad joke. Virtually every one of the more than 20 separate onboard systems has failed on at least one occasion: everything from springs in door locks to a catastrophic hydraulic failure in our windlass. However, we&apos;ve yet to have our schedule altered by mechanical problems. How is that possible? With some luck. For instance, our windlass problem happened at a scheduled port stop at Cebu, Philippines, and we were able to get a replacement part from Manila in 12 hours. Much more often we have been able to troubleshoot our problems using the extensive collection of service manuals that came with the boat, coupled with telephone or email assistance from U.S.-based suppliers and friendly experts. We have been able to effect temporary repairs with spares, the replacements being hand-carried from the States with our constant flow of guests. A key to the smoothness of our adventure has been reliable communications and excellent support from my office in the United States. Although Whale Song came with Sat B and Mini-M satellite links, these are now nonfunctional. In their place we have an Iridium satellite phone with a data modem, an Inmarsat BGAN transmitter/receiver that feeds any laptop or telephone, along with U.S. and local cell phones. The local cell phones that we have purchased in Trinidad, Brazil, Japan, and Indonesia have been great. They are cheap, so we get two; one stays on board, and the other goes with the shore parties. Because cell service, even in the Third World, is so much better than in the United States, we can easily and economically communicate with agents, shore providers, and each other. Via cell phone, my U.S. staff assures me that funds are transferred, spares are delivered, and missing information is obtained as we require. Finally, we have been very successful in hiring local talent. Interpreters/guides in Brazil, Peru, the Galapagos, Japan, and Indonesia have greatly enriched our local experiences and enabled us to find and visit sites that we certainly would have missed if we had been on our own. Pilots in Brazil, Antarctica, Papua New Guinea, and Indonesia have given us the confidence to explore rivers and anchorages not mentioned in our library. Security guards in Guyana, Brazil, Peru, and Indonesia have provided our insurance carriers comfort and given us peace of mind at night. Our guiding principle is this: you are only here once, so use time to your best advantage to get the most out of your visit. To view Whale Song&apos;s specs and modifications and a list of resources for world cruising, visit the Web Extras for this issue at passagemaker.com.